One of Europe's most historic cinemas has been returned to its former glory after a £3.5m restoration. The Picture House in Campbeltown, designed by celebrated cinema designer Albert V Gardner, first opened in 1913. The distinctive art nouveau building by the banks of Campbeltown Loch was one of the first purpose-built cinemas in Britain. It is set to reopen to the public within the next few weeks but the opening date is still to be confirmed. The first pictures have now been released of the interior of the cinema - which replicates the way it looked after a refurbishment in 1935. 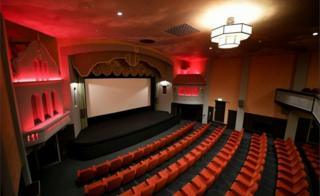 Designer Gardner, who studied architecture at The Glasgow School of Art between 1901 and 1905, was invited back to Campbeltown 20 years later to modernise the cinema's interior. He followed the "atmospheric" style which was popular at the time. Atmospheric cinema interiors transported audiences to exotic places such as European courtyards or gardens. The ceilings were often painted with starry skies or wispy floating clouds while other elements included trellises, balconies and painted trees. Gardner embellished Campbeltown Picture House with a blue sky with moving white clouds projected across it, and two plasterwork buildings (known locally as the "wee houses") on either side of the screen. The effect was to give the auditorium the ambiance of a Mediterranean courtyard. These special features have been meticulously restored with other elements of the original design such as the art deco lights recreated by contemporary craftspeople. Few of these atmospheric cinemas now survive with Campbeltown Picture House being the only example left in Scotland and one of only a handful in Europe. The cinema celebrated its centenary in 2013 but closed a year later while efforts to secure its refurbishment continued. The £3.5m has come from a number of sources including the Heritage Lottery Fund, the Scottish and UK governments and other public agencies. There have also been private donations and local fundraising. For the past 30 years, the cinema has been run by Campbeltown Community Business. Chairman Jane Mayo said: "We are incredibly proud to have such an historically-significant building here in Campbeltown and delighted to have been able to restore it to its original glory. "Campbeltown Picture House is unusual in that the original architect was also responsible for the later upgrade of the cinema, creating a unique combination of art nouveau exterior and atmospheric interior." She said the restoration was based on detailed archival research. "Among the elements of 1935 design that have been reinstated are the repainted ceiling, the colour scheme for the "wee houses", specially made art deco lights and indeed the return of the historically popular 'love seats'," she said. Lucy Casot, head of the Heritage Lottery Fund in Scotland, said: "The Picture House has provided Campbeltown with a centre for entertainment for the last 100 years. "It's very exciting to have a glimpse of it, as magnificent as it was the day it first opened its doors. "Thanks to National Lottery funding, it won't be long until the restoration of this well-loved building is complete so that it can once again takes its cultural role in the community bringing joy to all those who visit it." In recent years several other projects have played a part helping to regenerate Campbeltown and the surrounding area which had suffered years of economic decline. Two derelict hotels have been reopened, a new golf course built and the town hall and other nearby buildings restored. A seasonal ferry service to Ardrossan has also been established to provide an alternative to the long road journey to Glasgow. The hope is that the restored Picture House could help attract more tourists to the area. Although it will re-open within the next few weeks, an official opening ceremony is expected to take place nearer the tourist season. There is also a plan for a special festival next spring to help raise its national profile.